Iditarod officials said this month that sled dogs from Dallas Seavey's team tested positive for a prohibited drug after finishing the 2017 race. It's the first time the race has announced a positive result from a sled dog's drug test since it started testing in 1994. Seavey, a four-time Iditarod champion, vehemently denies giving his dogs the drug, tramadol — an opioid pain reliever often prescribed to both dogs and humans. The Iditarod bans the use of tramadol during the race. Seavey believes someone else gave his dogs the drug "maliciously." A race spokesman has said Iditarod officials don't know how the drug got into the dogs' systems. Race officials have not penalized Seavey for the positive test result, but they have revised drug-testing race rules for next year. March 14, 6:24 p.m.: Dallas Seavey finished the 2017 Iditarod in second place after 8 days, 6 hours and 24 minutes on the trail. He arrived in Nome with a team of seven dogs pulling his sled, two more than the minimum number of dogs required. "I had a pretty hard race into the last part — I was running and pedaling. It was a close finish," he said in an interview Tuesday. 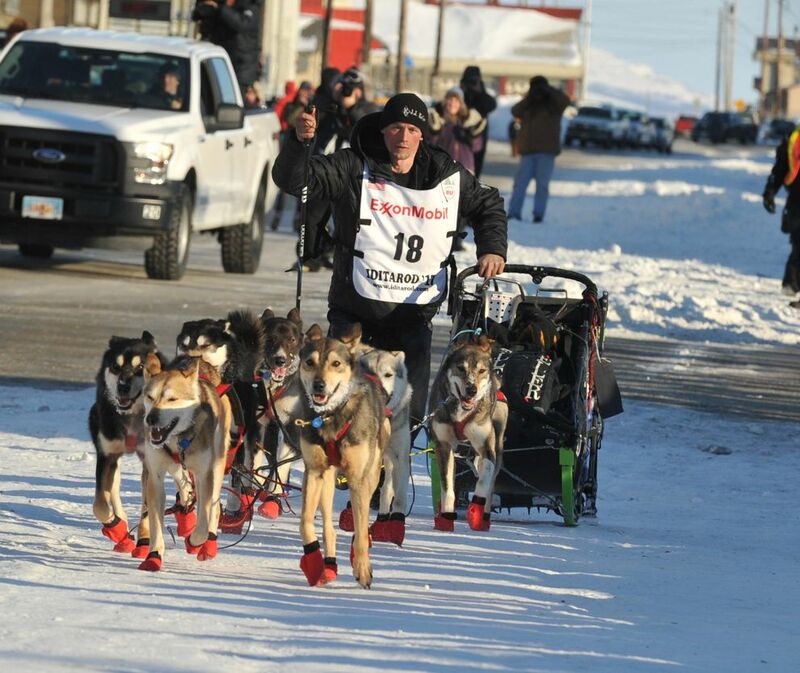 Seavey said he, his family and his kennel staff took the dogs to the Nome dog lot to rest, an area where all dog teams go after racing 1,000 miles through Alaska wilderness. Seavey then went to a pizza restaurant and afterward, he said, "I crashed for the next 16 hours." This was Seavey's 11th time competing in the Iditarod. His second-place finish broke a three-year winning streak. He also won the 2012 Iditarod. March 15, roughly 12:24 a.m.: Seavey's dogs were drug-tested in the Nome dog lot, with one of Seavey's kennel staffers present, according to Seavey. By 12:30 a.m., Seavey and only three other teams had reached Nome. Dogs from each of the top 20 teams are drug-tested at the race's end. A drug testing team "comprised of three trained individuals" collected urine samples from four of Seavey's dogs, according to an Oct. 23 statement from the Iditarod Trail Committee, the nonprofit that stages the race. Another person transferred the urine samples from the bags to three cups and placed tamper-proof seals and identifying barcodes on those cups, the Iditarod statement said. "One cup contained two samples from two dogs, a common practice known as batching," the statement said. It said the three cups were put in a locked box and moved to a "secured freezer" in Nome. Seavey said he also had arranged for his dogs to get their blood drawn so he could compare results from the panel to samples taken before they started the race. He said he hoped the results would help determine how long it takes his team to recover. March 16: The urine samples were shipped to a certified lab, according to an Oct. 23 statement from the Iditarod Trail Committee. The lab was not named. March 17: The first 5-milliliter portions of the samples were analyzed at the lab, said the Iditarod statement. March 20: A second analysis was performed on portions of the urine samples "to confirm the presence of tramadol and its two metabolites," according to the Iditarod statement. The lab recorded levels of tramadol at 254 nanograms per milliliter. The testing instrument was "noted to be 'Saturated/Overloaded,' " according to the Iditarod statement. April: Seavey said he got a call from Mark Nordman, Iditarod race director and race marshal, alerting him of the positive results from his dogs' drug tests. "Shortly after April 10," the lab result data was sent to Seavey, according to the Iditarod statement. Oct. 9: The Iditarod's governing board, the Iditarod Trail Committee Board of Directors, released its first statement about a positive drug test during the 2017 race. The board said it voted at its Oct. 6 meeting to revise its race rules after "several" sled dogs in a single musher's team tested positive for a "prohibited substance." Race officials said they likely couldn't penalize the musher under the 2017 race rules because they couldn't prove intent. They declined to name the musher, the drug the dogs tested positive for, where the dogs were tested on the trail and how many dogs tested positive. A race spokesman said "legal concerns" and "confidentiality" prevented them from releasing the information. "Because of the sensitivity of this matter," the statement said, "the ITC does not intend to disclose the name of the musher involved." The Iditarod board voted to revise the race rules for 2018, shifting the burden of proof to mushers. Oct. 17: The Iditarod Trail Committee released a second statement with additional information on the positive drug tests. The statement said the sled dogs tested positive for tramadol and the urine samples were collected six hours after the team finished the race. It said the drug could have been given to the dogs anytime between right before the samples were taken and 15 hours prior to that. The name of the musher was not released. Asked why the Iditarod decided to release the additional information, Chas St. George, a race spokesman, said: "Speculation about a myriad of potential drugs has been surfacing over this last week within media and social media. The ITC felt it was important to disclose the drug (Tramadol) because it is a drug that is commonly administered to both canines and humans to relieve pain." Oct. 18: The musher (still unnamed) whose dogs tested positive for tramadol released an anonymous statement through the Iditarod Official Finishers Club. The musher called himself or herself "Musher X." The statement was sent to the mushers who belong to the club and was later leaked to the Alaska Dispatch News. Musher X said in the statement he or she did not give the dogs tramadol and called the Iditarod's handling of the test "deeply flawed." Oct. 19: People for the Ethical Treatment of Animals (PETA) called for the Iditarod to "strip all mushers implicated in doping dogs of their titles and awards." Oct. 21: The International Federation of Sleddog Sports released an open letter to the Iditarod Trail Committee. The organization, which bills itself as "the official international organization for sleddog sport," distanced itself from the Iditarod. It said it's "unfortunate" the Iditarod Trail Committee "chose to follow an anti-doping protocol that it cannot enforce" and that the committee's "inattention to developing an infallible anti-doping protocol" put at risk the reputation of a potentially innocent musher, the integrity of the race itself and "the entire world of mushing." Oct. 22: The Iditarod Official Finishers Club held an emergency meeting to discuss the drug test issue. Oct. 23, 7:45 a.m.: The Iditarod Official Finishers Club released a strongly worded statement demanding the Iditarod release the name of the musher whose dogs failed the drug test. The statement was signed by more than 80 mushers, including some currently racing and others retired from the sport. The club also said it did not support how the Iditarod handled the drug test issue and demanded more transparency moving forward. It demanded that Iditarod officials rework the drug testing rule, which they had recently revised, and also that the Iditarod extend the deadline by which mushers can withdraw from the 2018 race and still get their $4,000 entry fee refunded. Oct. 23, 1:30 p.m.: The Iditarod Trail Committee released a statement that detailed how a lab tested the urine samples from the team of "Musher X." It also tore apart the Musher X statement from the week before, calling many of the claims in the anonymous statement false. Oct. 23, 3:45 p.m.: The Iditarod Trail Committee released a statement naming Dallas Seavey as the musher whose dogs tested positive for tramadol in the 2017 race. The statement said the Iditarod was naming Seavey "because of the level of unhealthy speculation involved in this matter." Oct. 23, roughly 4:15 p.m.: Dallas Seavey posted a nearly 18-minute-long YouTube video. He said he did not give his dogs tramadol and that he believed someone probably gave the drug to his dogs "maliciously." Seavey also announced he was dropping out of the 2018 Iditarod. Oct. 24: Dallas Seavey was interviewed by several news organizations. He criticized the way the Iditarod board of directors handled the drug tests and repeated that he believes his dogs were most likely given tramadol as an act of sabotage. There were many people around who could have done it, he said, including members of anti-mushing animal rights groups. – When were Seavey's sled dogs given tramadol? Seavey said in his anonymous "Musher X" statement last week that he was told by Mark Nordman, the race director and race marshal, that the dogs likely ingested tramadol after the race ended, given the high levels of the drug in their systems. The Iditarod Trail Committee said Nordman never told Seavey that. The committee said, "Based on the test results, it was estimated that the drug could have been administered somewhere between fifteen hours prior to, and up until the time the team was tested in Nome." Roughly 15 hours before the the urine samples were taken, Seavey's team was leaving the village of White Mountain, 77 miles from Nome. He departed from the checkpoint at 9:35 a.m. March 14, according to the Iditarod website. – What happened with the labeling of the samples? In Seavey's anonymous "Musher X" statement, Seavey said three test results were emailed to him. Only one identified the dog allegedly tested; one had two different dogs' names on it; the third said "they couldn't make out the dog's name." The Iditarod said in an Oct. 23 statement that at the time of testing in Nome, each cup containing a urine sample had a barcode on it, and each "sample submission card" identified the dog by bib number and dog tag letter. It said one cup contained two samples from two dogs, "a common practice known as batching." The Alaska Dispatch News has not seen a copy of the results. – What about the testing of a B sample? Seavey said in his anonymous "Musher X" statement that a "B test" was not done. He said that after a positive result from a drug test, "standard procedure" would dictate that the musher is present while the "B sample" of urine is confirmed to be from the musher's team, chain of custody is reviewed and the sample is opened and tested. The Iditarod Trail Committee said in an Oct. 23 statement that the samples were tested twice in the lab and Seavey never requested portions of the remaining samples be sent to another accredited laboratory for a third test. In an interview, Seavey questioned when he was supposed to make that request since he was never asked to present his side of the story before the board or a panel of experts before news of the positive test spread. – What was going on between April, when Seavey found out about the positive test, and October, when the Iditarod announced it? Seavey said in an interview Tuesday that he had several phone conversations with Nordman and was told he would not be penalized for the positive drug tests and was led to believe the issue was over. In the "Musher X" statement, he said he was also led to believe that Nordman and the Iditarod's chief veterinarian "suspected either an accident or possibly foul play in the Nome dog lot or food bags." He also said he was told by the chief veterinarian that given the levels of the drug present at the time of testing, the musher would have been "completely ignorant of the drug" to think the dogs would not test positive in Nome. In an Oct. 23 statement from the Iditarod, the race officials said they "never made a determination that it was unlikely Musher X administered the drug in question." They also said they never told Musher X that the issue was resolved and no further action was necessary. The statement did not address the veterinarian's comment. Chas St. George, a race spokesman, said Iditarod officials and legal counsel had worked on revising the race rule about dog drug testing for several months before the Iditarod board voted on the change and issued the first press release on it, on Oct. 9. This story has been updated to include additional information about the blood panels Dallas Seavey ordered for his dogs.